Zuckerberg makes the point that Facebook hasn’t exactly been sitting on its hands when it comes to these issues. “For Facebook, this means we’re making a clear and formal long-term commitment to do the things we’ve always tried to do and planned to keep doing — giving you tools to control who can see your information and then making sure only those people you intend can see it….In the last 18 months alone, we’ve announced more than 20 new tools and resources designed to give you more control over your Facebook experience…. I think this kind of back and forth between the institutions we entrust with our data – like Facebook – and those we entrust to oversee the common good – our government – is healthy and good for society. The bigger question, to my mind, is what kind of culture we are becoming as we decide to share all this information, regardless of whether we truly understand or even consider the implications of doing so. The settlement will enter a period of public comment for the next month, then, presumably, it will be finalized. Hi John, Thanks for posting this. I agree with you that it’s great to see this type of back-and-forth between the FTC and Facebook. you are right, I meant to put that in and will add it. Unless I missed something, this appears like barely a slap on the wrist, instead of a slap in the face (pun, yes). Why weren’t there punitive damages? 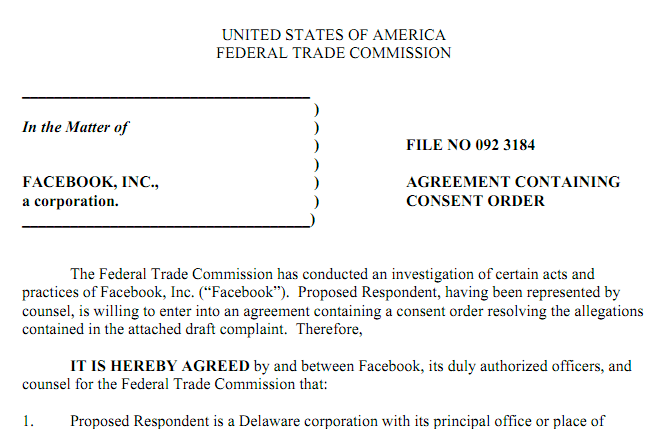 It seems that the FTC wrote the policy that FB should have written and adhered to in the first place, themselves. It is surprising that FTC didn’t fine FB. It certainly looks as if FB deliberately said one thing but did another. Once the settlement is finalized, wonder if there will be private lawsuits against FB. Also, the FTC settlement will have a bearing on the far more stringent privacy laws in the EU and individuals countries such as Germany. 6A6ZYYFJL I like it very much!